Mobile Connect is a small button that hides a lot of complexity. A challenger to "Login with Facebook" with future ambitions to allow electronic voting, the idea emerged from within the GSMA (which represents more that 800 mobile operators worldwide) and needed a way to communicate not just the user experience, but the more fundamental technological challenges that it posed if it were ever to be a success. The first month of the project was an investigation into the technical complexities of what would happen behind the scenes when a user tapped "log in". 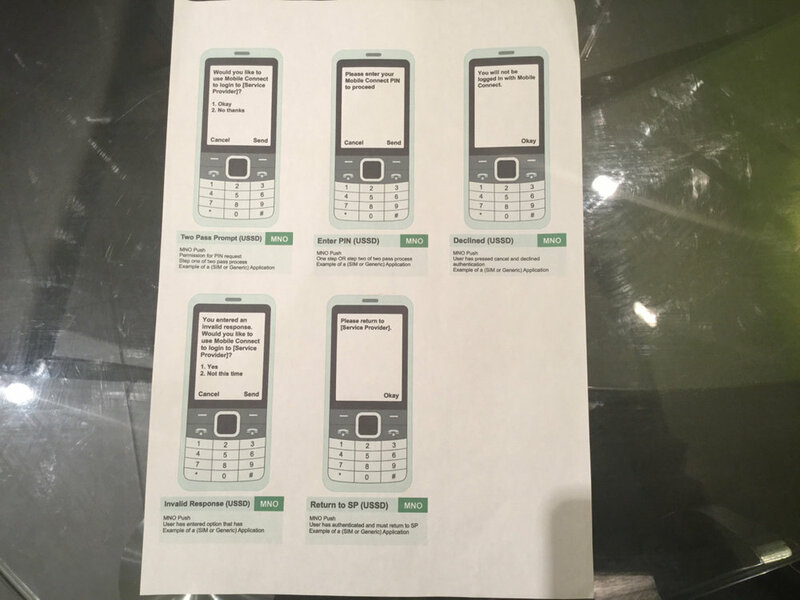 We first mapped out all the different devices that would work on; and as it was a global project it had to work in markets that still dominated by feature-phones as well as the most modern devices. We mapped out technical scenarios (was this to post a comment or make a transaction etc) and flow diagrams to illustrate the logic. Soon, we realised the limitations of traditional methods. 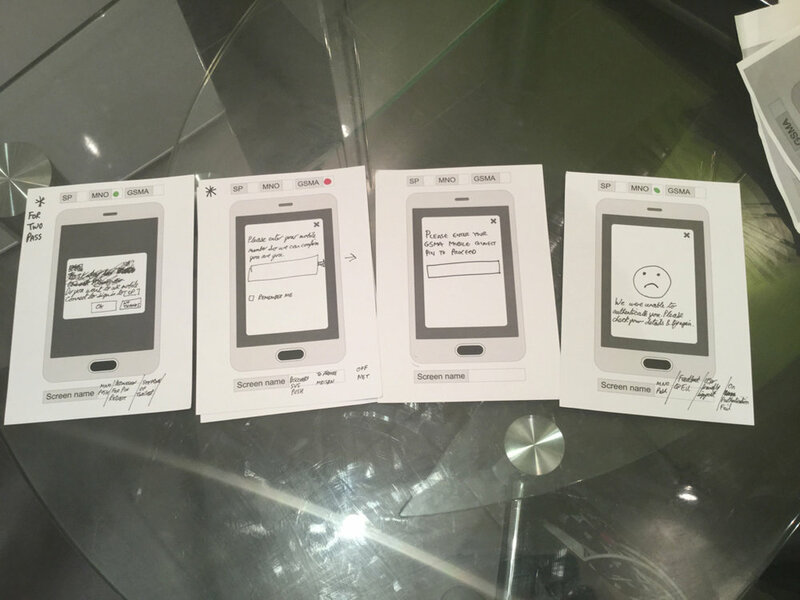 We were in a race against time to get a working prototype for the 2014 GSMA World Mobile Congress, and mapping the logic for each of the 155 chosen scenarios using flow diagrams in order to build a working prototype was not an option. I therefore created a new method, a card game that I played with the key stakeholders to rapidly map out each scenario in a fraction of the time. Once they got the knack of how it worked, I created worksheets they could fill in in place of the cards. As each "card" corresponded to a screen template within Axure, I could now apply the logic to a frontend interface so that engineers could simply enter a few options to see how the login experience should look and function across a huge number of technical scenarios. We successfully demonstrated the proposed product at the World Mobile Congress and a pilot project was then quickly proposed in Sri Lanka. If anything, the mobile operators were taken aback by the level of detail. "I think we were a little ahead of our time with it at first but once the Operators [were] ready to see that level of detail it is really well received." said product manager Jo Gilbert. Today, Mobile Connect is available to over 2 billion customers. Marketing Programme Director was also happy with the project; "I worked with Jamie on a complex, innovative and far reaching Telecommunications project. His input on the streamlining of the user experience and journey was invaluable. His proposals were well considered, practical and forthcoming, Always the professional, Jamie is organised and approachable, making him very easy to work with. I have no hesitation in recommending Jamie and would be delighted to collaborate with him again."